Manhattan improved to 2-1 with a 55-0 blanking of Topeka Highland Park. The Indians scored 28 points in the first quarter and led 49-0 at halftime. Kevontae McDonald scored touchdowns on three of his four carries on the night. Highland Park has now lost 28 consecutive games. Senior Will White led the Scots with 54 rushing yards on seven carries. The Hutchinson Salthawks improved to 3-0 with a 55-20 win over Salina Central. Brody Smith and Davian Vigil both had big games for Hutchinson. Smith scored two rushing touchdowns, and Vigil returned an interception 25 yards for a touchdown. Junior Brogen Richardson passed for 232 yards and a touchdown on only nine completions for Salina Central. Garden City improved to 3-0 after a 46-0 win over Wichita South. Senior quarterback Garret Doll passed for 216 yards and three touchdowns. Sophomore Avey Arana rushed for 115 yards and a touchdown on only 14 carries. Junior Tye Davis led the receiving corps with four catches for 88 yards and a touchdown. Blue Valley Northwest edged Blue Valley West 35-28. It was the Huskies’ first victory after losses to Blue Valley North and Mill Valley. Payton Hartman passed for 219 yards and two scores for the Huskies. Hartman spread the ball around as four different Husky receivers has at least four catches, led by Jackson Heath’s seven receptions for 78 yards and a touchdown. Sophomore Edward Thomas led Northwest with 132 yards rushing and a score, while Keaton Goodale rushed for 126 yards and three scores for Blue Valley West. It was the first victory for Clint Rider as the Blue Valley Northwest head coach. Rider previously spent four seasons at Hesston. Wichita Southeast topped Wichita North 49-42 after Quinton Thomas connected with Ollie McGee on a 40-yard touchdown pass with less than a minute to play. It was the Golden Buffaloes’ first win of the season. Wichita Heights throttled Dodge City 65-0 to earn its first win of the season. Heights junior quarterback K’Vonte Baker rushed for a school-record 454 yards and eight touchdowns. If that’s not crazy enough, Baker achieved those totals on only 13 rushing attempts. He averaged nearly 35 yards per carry. Valley Center scored 21 points in the first quarter and stuffed Arkansas City’s run game in a 35-7 victory. The Hornet defense held the Bulldogs to negative three rushing yards on 19 carries in the game. Larry Wilson led Valley Center with 121 yards on the ground and a touchdown. Shawnee Heights improved to 3-0 by holding off Washburn Rural, 20-15. Heights built a 20-0 lead and held off the Junior Blues’ fourth-quarter rally that included a safety and two touchdown passes by back-up quarterback Michael Schurig. Schurig’s pass to Preson Wiliams with just over a minute to go pulled Rural to within 20-15, but Heights recovered the onside kick. Heights rushed for more than 250 yards led by Mitchell Lady’s 77 yards and a touchdown. Lady also threw for 137 yards and added a touchdown pass to Zach Cummings. Bonner Springs grabbed a 24-7 win over Kaw Valley League rival KC Piper. The Braves led 10-0 at halftime and extended the lead to 24 with a pair of third-quarter touchdowns. Bonner Springs will travel to unbeaten Tonganoxie this week. The Chieftains have outscored their opponents by an average of 40 to 9 this season. Newton held off Goddard-Eisenhower 31-29 thanks to eight Eisenhower turnovers. The Railers took the lead for good after Kolyn Sauceda returned a Tiger fumble for a touchdown mid-way through the fourth quarter. Eisenhower missed a field goal to take the lead with under 30 seconds remaining. Colton Davis threw two touchdown passes and rushed for another in the win. Isaiah Presley added 90 yards rushing and a touchdown for Newton. 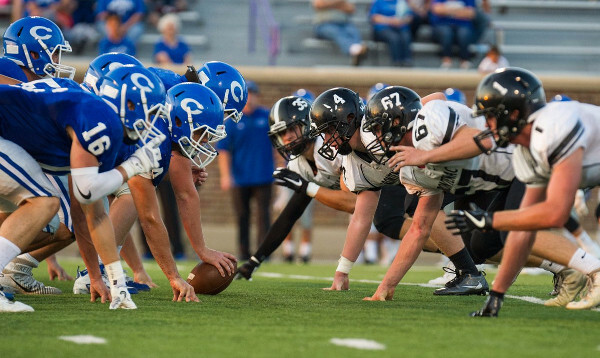 Maize South isn’t the only Class 4A Division I team that hasn’t allowed a point this season. Basehor-Linwood earned its third consecutive shutout with a 63-0 win over KC Turner. The Bobcats have outscored their opponents by a combined score of 173-0. Andale improved to 3-0 with a 48-20 win over Mulvane. The Indians forced six turnovers in the victory. Andale quarterback Ethan Baalmann rushed for 173 yards. Fort Scott moved to 3-0 in the Southeast Kansas League by defeating Chanute 34-13. Fort Scott’s Zarek Fewell rushed for three touchdowns in the win. Independence held off Parsons 56-50 in a shootout in the Southeast Kansas League. Independence rushed for seven touchdowns in the game led by quarterback Josh Pralle and running back Amauryon Farley who each rushed for three scores. Pralle also returned a kickoff for a touchdown. Parsons was led by sophomore Daquan Johnson who had quite a start in filling in for injured starter Gage Friess. Johnson rushed for 170 yards and five touchdowns, and passed for 372 yards and two more scores. El Dorado scored its first points of the season and earned its first win, beating Clearwater 25-21. Kyle Bobbitt returned a fumble 37 yards for a touchdown to secure the win. Bill Shaw earned his first victory as El Dorado’s head coach. Augusta improved to 3-0 with a 26-0 win over Towanda-Circle. Orioles quarterback Chance Whitehead passed for 142 yards and two touchdowns. Michael Adams led the Augusta defense with 10 tackles. Eudora ended an 8-game losing streak with a 42-6 win over KC Sumner Academy. The Cardinals scored 21 points in each of the first and second quarters in cruising to victory. Elijah Kennedy led Eudora with three rushing touchdowns, while Carter Neis added two more scores on the ground. Prior to Friday night, Eudora’s last win came 54-0 against Sumner last season. Burlington shut out Prairie View in the second half en route to a 40-26 victory in the Pioneer League. The two teams traded touchdowns in the first half before Prairie View took a two-score lead, 26-16, on a Justin Scott touchdown run. Burlington would march down the field late in the half and get a touchdown from Connor Jeffers to pull within 26-24 at the break. The Wildcats would add a touchdown in the third and fourth quarters for the win. Jeffers passed for 150 yards and rushed for 51 yards and three touchdowns in the win. Hunter Boone added a pair of touchdowns for the Buffaloes. Colby scored all 14 points in the first half but held on to defeat Hugoton, 14-12. The Eagles led 14-6 at the break thanks to a pair of Zach Hart touchdown runs. Hart rushed for 39 yards and passed for 58 yards in the win. Jordan Schippers led Colby with 102 yards rushing on 23 attempts. Hugoton managed only 92 yards on the ground led by Mitchell Hamlin’s 38 yards and a touchdown. Baldwin held off Ottawa 20-12 to pick up their second Frontier League win. Quarterback Luke Laskowski rushed for three touchdowns to lead the Bulldogs, while Ottawa quarterback Caleb Shaffer threw touchdown passes to Elias White and K.J. Savage. Ulysses led Holcomb 8-7 at halftime, but the Longhorns shut out the Tigers 28-0 in the second half to win 35-8. Quarterback Trey Gilbert completed only nine passes, but five of them went for touchdowns. Gilbert threw for 159 yards and five scores; two each to Chance Rodriguez and Carter Blackburn. Smoky Valley rushed for more than 300 yards in defeating Haven, 36-6. The Vikings were led by senior Kyle Anderson’s 103 yards and a touchdown on 17 attempts. Junior Tim Lambert added 46 yards rushing and a pair of touchdowns. Smoky Valley led 22-0 at halftime. After a big Week 2 league win against Sacred Heart, Russell defeated Southeast of Saline 28-27. The loss ended Southeast of Saline’s 11-game league winning streak. Russell came back from an early 13-0 deficit and trailed 19-14 at half. Russell led 21-19 to start the fourth quarter when Austin Price scored on a two-yard run with five minutes left. Russell finished plus-four in turnover margin. Osage City defeated Olpe, 22-13, and moved to 3-0. Olpe led 7-6 early, but Osage City had several big plays to pull ahead. Quarterback Tucker Kimball opened the scoring with a 13-yard touchdown pass. He scored on a five-yard run for a 12-7 lead at halftime. On 3rd and 15, Kimball found Trenton Plinsky on a 60-yard catch. The Indians have permitted just 19 points in three contests. Last year, Osage City was 2-5 after seven contests and finished 5-6. In a key Hi-Plains League battle featuring previously undefeated teams, Lakin defeated Elkhart, 34-18, and moved to 3-0. Senior Dawsen Shalberg took the opening kickoff 91 yards for a score. The Broncs led 20-6 at the end of the first quarter. Elkhart ran 61 pays for 285 yards, and Lakin finished with 36 plays for 256 yards. Elkhart quarterback Lane Whisennand rushed 31 times for 177 yards and three TDs. He completed 3 of 3 passes for 11 yards. Cherryvale scored 39 points in the first half in rolling past Eureka, 47-18. The Chargers led 25-0 before Eureka scored on a fumble return for a touchdown. Cherryvale rushed for more than 260 yards in the game while holding the Tornados to negative rush yards. Cade Addis threw three touchdown passes for Cherryvale, and the Charger defense returned two Eureka interceptions for scores. In a lightning-delayed contest, Norton rolled over Oakley, 51-0. Tevin Petrie rushed for three touchdowns and tallied an 80-yard kickoff return. Jace Ruder threw for a pair of scores. Norton travels to Smith Center this week in the rivalry Mid-Continent League matchup. The La Crosse Leopards defeated Washington County, 34-7, to pick up their first win. Hunter Morgan threw for two scores, and Zak Brown rushed for a pair of TDs. Morgan passed for 87 yards and rushed for 93 yards. Washington County has already announced it has forfeited this week’s game versus Hoisington due to lack of players. After a rare 0-2 start, Meade earned the first victory under new coach Justin Powell with a 49-16 road win against Southwestern Heights. Meade led 21-0 at halftime. Senior quarterback Tristan Haynes completed six of 11 passes for 42 yards with a touchdown. He tallied 25 carries for 133 yards and three TDs. Senior Lander Martin had a strong all-around game with 10 carries for 83 yards and a rushing score. Defensively, Martin recorded a tackle for loss and an interception. Doniphan West defeated Hiawatha, 26-21, on the road. Doniphan West led 20-14 at halftime and had a big performance from Levi Watts, a four-year starter at quarterback. He completed 16 of 27 passes for 342 yards with a 3/1 TD/INT ratio and rushed for a score. Seniors Zeb Speer and Luke Blevins combined for 11 catches for 286 yards and three TDs. Senior Matt Buster had 18 tackles. On Thursday, St. Mary’s Colgan controlled the clock and used a solid defensive effort to shut out rival Frontenac, 20-0. Junior quarterback Cade Simmons broke multiple tackles for a 21-yard touchdown run in the second quarter to give the Panthers the 7-0 lead. That lead would hold until Simmons hit Jeremiah Buche in-stride for a 30-yard touchdown with just over four minutes remaining in the game. After holding the Raiders on downs, Simmons broke free for a 40-yard run with less than three minutes left. Colgan controlled the time of possession running 60 plays to Frontenac’s 32. The Raiders were hurt by four turnovers and more than 100 yards in penalties. West Elk defeated Cedar Vale-Dexter, 48-0, in a home victory. The Patriots scored 16 points in the first quarter, and 32 in the second. Senior Cade Miller had another strong game with 3 of 5 passes for 82 yards with a touchdown. He rushed 10 times for 100 yards and four scores. West Elk finished with 28 rushing attempts for 224 yards and five TDs. Hoxie ended a six-game losing streak against Sharon Springs-Wallace County in a 52-0 victory. The Indians scored 22 points in the first quarter and 30 in the second. Hoxie finished with 171 rushing yards and five rushing TDs, all from Jared Kennedy and Latham Schwarz. The Indians and Division II South Barber are the only eight-man teams to not permit a point this season. Hoxie plays host to Atwood-Rawlins County in a huge District 8 matchup this week. Ness City defeated St. John, 56-6. Brennan Chacon tallied 15 carries for 150 yards and two scores. John Pfannenstiel finished with 88 yards and three rushing scores. Ness City tallied 343 rushing yards en route to its first victory. WaKeeney-Trego improved to 2-1 with a 50-0 win against Quinter in a game that ended in the third quarter. Keagan Shubert passed for 103 yards and a pair of scores. Dallas Schneider finished with seven carries for 116 yards and two TDs. Logan-Palco defeated Thunder Ridge, 46-0, and moved to 3-0. The Trojans limited the Longhorns to 15 yards in total offense. Logan-Palco tallied 219 rushing yards. David Thompson finished with 19 carries for 179 yards and two TDs. Thunder Ridge has now lost 17 consecutive games. Canton-Galva moved to 2-1 with a 46-0 victory against Peabody-Burns. Eagle quarterback Landon Everett accounted for five scores, two rushing and three passing – all to Dylan Wood. Canton-Galva had lost five in a row to the Warriors and was 1-7 in its last eight meetings in the series. Canton-Galva was 3-15 in the last two seasons before 2017. Sedan defeated Oxford, 46-0, in a game that ended in the third quarter. Sophomore quarterback Tayte Halderman scored on runs of 11, 63, 1 and 1 yards. Cody Joslin added 112 yards on the ground and two scores. Altoona-Midway snapped a 28-game losing streak with a 44-28 win over Chetopa. The Jets led 28-26 entering the fourth quarter and a 60-yard touchdown run by Jimmy Willard extended the lead to 36-26. Willard led Altoona-Midway with 141 yards rushing and two scores, while quarterback Dawson Ashmore passed for 195 yards and three touchdowns. Altoona’s last win during a varsity season came on October 27, 2011 when the Jets beat Tyro Christian, 45-24. Sylvan-Lucas Unified defeated Lincoln, 52-6, and moved to 3-0 for the second straight year. R.J. Haberer rushed for three touchdowns and added a passing TD. Tyler Barrientes had a rushing TDs, and Owen Krueger delivered two rushing TDs. Caldwell defeated Central Burden, 56-6, and remained undefeated. Corbin Rice accounted for six touchdowns, four rushing and two passing. He rushed for scores of three, one, 44 and 15 yards. Both of his passing scores went to Jalen Risley (57 and 65 yards). Caldwell led 42-6 at halftime. Mankato-Rock Hills stayed perfect with a 64-18 home win against Chase. The Grizzlies led 14-0 after the first quarter and 38-6 after the second. Rock Hills rolled up 51 plays for 489 yards of offense. Junior quarterback Dereck Gillett completed 15 of 20 passes for 222 yards with a 4/0 TD/INT ratio. Junior Zane Colson tallied 11 offensive touches for 255 yards and four scores. The Grizzlies have defeated each team by the 45-point margin. Rock Hills opened 4-0 in ’15 and 5-0 last year. Veritas Christian scored 16 points in the fourth quarter to top the Manhattan-Flint Hills Christian Eagles, 28-24. Veritas trailed 24-12 entering the fourth quarter before scoring twice to overtake their Eagle counterparts. Quinton Donohoe passed for 148 passing yards and two touchdowns and ran for 80 yards and another score. Trey Huslig and Grant Schuck each caught touchdown passes from Donohoe. St. Mary’s Academy took a big step towards the KCAA regular-season title with a 60-38 win over Wichita Homeschool. The Crusaders extended their win streak to 12 consecutive games by outscoring the Warriors 28-14 in the second half. St. Mary’s led 32-24 at halftime. The Crusaders defeated Wichita Homeschool 38-14 during the 2016 regular season, and 30-24 in overtime in the KCAA title game. Cheylin blew past Golden Plains 72-31 behind another huge night from senior Manny Castillo. Castillo rushed for 310 yards and four touchdowns on 19 attempts to carry the Cougars to victory. Castillo also returned a kickoff 60 yards for another score. Freshman Colton McCarty added 162 yards rushing and three scores while passing for 54 yards and two more touchdowns. Wheatland-Grinnell scored 36 points in the first quartering shutting out Western Plains, 48-0. Junior C.J. West rushed for three touchdowns to lead the Thunderhawks. Wheatland-Grinnell’s defense scored a pair of touchdowns on a fumble and an interception return.